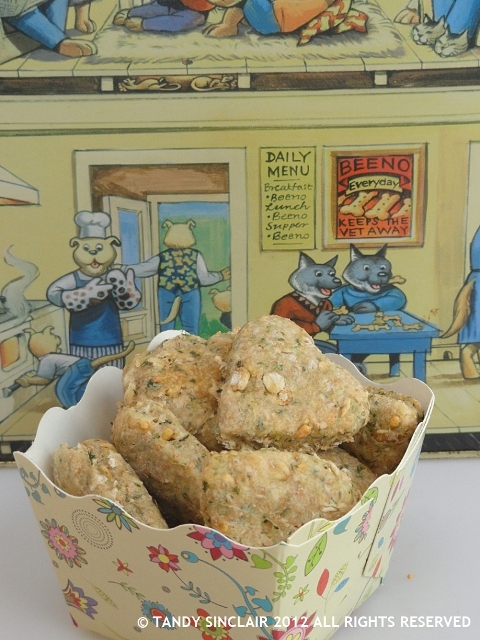 These dog biscuits are easy to make and a great, healthy treat for your fur kids. My children present themselves with 4 legs and a tail. They are both Jack Russell’s and they are the busiest dogs known to man, next to a Boxer. We have two of them, one an 11 year old 10kg bundle of naughtiness, and the other a 2 year old 5kg bundle of cute. They both love travelling in the car and Patch (the 11 year old) would prefer to stand on the front seat with her paws on the dash, watching the world go by. Of course, she is not allowed to and travelling in the car with her has me saying over and over again like a stuck record “Patch, get in the back”. We don’t often take her in the car, but she has been known to run away just to get a ride on the front seat. Molly is far better behaved and will stay in the back without being told to, and mostly she will sit on the floor. I am always so worried that I will be involved in an accident and the dogs will go flying. I am not sure why I worry about having an accident only when they are in the car, as I have never caused an accident in all my years of driving *knocks on wood* . I know that a loose object in my car does not stop moving when I have to brake suddenly, and in the case of a dog it would mean being flung out of the windscreen and causing untold damage including certain death for the dog. I know how hard a windscreen is as I have hit one and I have also seen what a windscreen does to a baby – the sight is not one you can forget. So, I am most perturbed when I see babies and young children not strapped in. I see this every day but yesterday I saw the worst incident ever – a toddler was hanging on to the open window with its head out of the car. The child could easily have fallen out of the car. I was gobsmacked. I don’t even let my dogs do that, so how can a mother who has carried this child for 9 months and given birth to it think that life is so cheap the child can hang out of the car? Oh, to be an undercover traffic officer for a day! do you travel with your animals? We are an animal household; 2 West HIghland Terriers, one chocolate lab, one russian blue cat and another tabby. BUT, I have never made them treats and I am very excited about this. If I try it I shall reblog linking back to you. Thank you Tandy and the happiest of New Years! Just popped in to wish you all the very best for the new year! Hi Tandy. I might try your biscuits. I usually make liver biscuits for the troops. It would be good to try something different. Thanks for the recipe Tandy. Will definitely be making this for my dogs. In the UAE we still see fathers driving with a toddler on their lap, clutching the steering wheel. I must make my two Border terriers some of these homemade biscuits. Hi Tandy and happy new year! I invite you to have a look and pass the Award forward. In Canada even bigger children have to be in Booster seats. When we were children we loved sleeping on the back window-sill of the car, I don’t know how we survived. What a special treat! Happy New Year! All the best for the new year. It looks and sounds like your dogs will have a great year as well. I’ve always wanted to make my own dog biscuits for my mom’s dog! These sound awesome! Mac goes in the back with a dog grille between him and everyone else. We’ve seen too many accident reconstructions to do otherwise.I completely agree with you, Tandy. Here in the UK seatbelts are mandatory: is that how it is in SA? Seat belts are mandatory as well but people have no respect for the law here sadly to say! Seat belts are mandatory here but people have no respect for the law in this country sad to say. I totally understad what you are saying about safety in the car. My children always use the seatbealt and Fernando is still using his chair. As for the dogs, they only come in the car to visit the vet and they go in the back… they don’t like the car very much 😉 but I’m sure they’ll love these cookies. Thanks for sharing! Hi Tandy, I’d love to have some pets again, but for the moment I’ll have to rely on everyone else’s four legged friends. I hope it’s not too long await before you can have a pet again! I wish we had a Starbucks here – I’m posting from my BlackBerry 🙂 they don’t expect us to have internet till March! Your internet service sounds like the service we had with I cable in HK- the worst ever. We switched to PCCW and now we have occasional issues but not the long chronic issues like we had with Icable. Time to switch providers if that is possible or do you have only one option. My kids have said that I’ve replaced them with my Chihuahuas…though its not totally true, there are many moments when I have to agree!! I make dog treats often for my babies, and I love the heart shape on these!! Happy New Year Tandy! Great recipe Tandy! In the UK and Spain we are required by law to strap our beloved pups in. They sell this great little strap which clicks onto their harness (they have those little body ones so they don´t tug on their necks) like a lead and the other end clicks into the seat belt holder. You can lengthen or shorten it so they can look out the window, but don´t go flying if you slam on the brakes and they can´t get into the front seats…very clever, and very safe! I will have to try these biscuits out on my “baby.” When she was a puppy, she was dreadful about roaming around the car but she’s much better these days and tends to sit still on the back seat. She hates being on her own so I think her relief at coming on a car journey and not left at home makes her behave. I’m not sure if you can get them here but in the UK you can get car harnesses for dogs. They’re a good idea if you do lots of car journeys with them. The biscuits looks yummy,your babies will love them. People are so careless with their kids in the car,they let them stand up,whilst they drive,in case of emergency stop,the child hits the windscreen,happy new year Tandy! Your rolling out to “5cm thick” should that perhaps read 5mm?